There’s no need to be on pins and needles about being treated with Acupuncture. 🙂 This centuries old method has been used to relieve pain. Legend has it that a sick Chinese soldier was hurt by an arrow and to everyone’s amazement, not only did the wound heal, but the soldier became well. 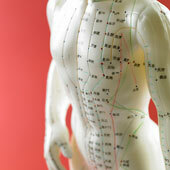 Thus began the research into all those places on the body where stab wounds healed – and “Acupuncture” was born. Now, two thousand years later, this therapy is highly popular as a healing method. In Acupuncture ‘qi’, or the life force circulates via the body along fourteen meridians that are close to the skin surface at specific points. When pressure is applied on these points – with needles or finger pressure (acupressure), the flow of qi changes to result in healing. So how does acupuncture work? The needles stimulate the nervous system, triggering off the release of endorphins that are the body’s natural pain relievers. Acupuncture is safe so long as the needles are sterilized. Side effects are rare and minor. At the most you would feel a sharp pain when the needle is inserted, probably with a little bleeding. In any case, the side effects are far, far lesser than treatment with drugs. You would need approximately six to twelve sessions to see results. However, remember to go to a licensed Acupuncturist. And yes, some health insurance companies do cover this treatment.